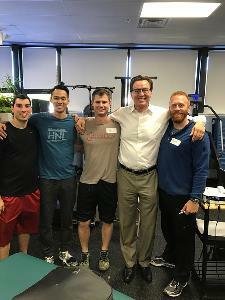 Mike Roberts and the good folks at Central Mass Physical Therapy did an excellent job hosting Impingement and Instability this past weekend in beautiful Worchester, MA. I was able to spend some time visiting family and friends and I took the opportunity to visit Minuteman National Park in Concord MA. Here the British Red Coats faced down the early colonists across the Old North Bridge prior to the firing of "The shot heard round the world". I went to the nearby Acton Memorial Library and saw the actual sword, a blood stained hat band and a lock of hair from 3 of the colonists that died on that day. Cool stuff. I'm a history buff and I had an awesome time taking in some of the great American history that region has to offer. Anyhow, as far as the course was concerned, we had a great experience exploring secondary level PRI integration with a fantastic group of people. We had a fun combination of rehab, strength, performance and training professionals in attendance who were willing to do their part to make it a great learning experience for the group. They came together to take a more advanced look at the science of PRI, after having done some of the due diligence required with our primary course material. Its always great to take things to the next level in a secondary course like this, especially with an interactive group who came prepared with so many great questions. We talked about the human sense organs and how all things come together to help us sense the space around us and the ground beneath us. The concept of reference centers was well received and it seemed to help all in attendance become better at what they already knew about PRI movement science. The questions were awesome and it was fun to demonstrate so many of the principles taught on course attendees with specific instabilities or a lack of perception and awareness across specific reference centers. Nothing teaches a confusing principle better than seeing it demonstrated on a person with a similar deficit or problem to someone you have seen yourself and didn't know what to do with. We talked about he many ways and reasons the human system becomes lateralized to the right and how the neurology of perceiving space, both the space around us and the space within us, helps us negotiate these lateral tendencies. There were a lot of "ah ha" moments as the class considered the affect of asymmetrical hyperinflation, overactive unilateral muscle chains and asymmetrical ways of stabilizing our body when we stop to rest or attempt to move. These principles were put into play to decrease the negative effects of calcaneal instability, patella femoral instability, ilium instability and scapular instability. The thoughtful questions from the group and their requests to see techniques demonstrated throughout the course added to our overall learning experience. So, thanks again for all the great contributions everyone and for making our time together so practical and fun. Fresh off of a weekend in Big Sky Country of western Montana! I thoroughly enjoyed the countryside and the crew that assembled to learn about triplanar AF hole control! 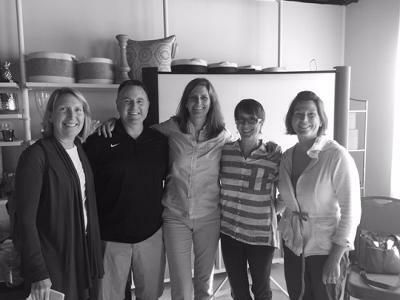 Thank you gracious hosts Angie Robertson, Dale Koch and St. Peter's Physical Therapy for your efforts to make a great weekend of learning possible. I enjoyed this group of movement scientists, many of whom were new to the arena of PRI, as we discussed acetabulofemoral and femoroacetabular mechanics for neuro patients, high level competitive athletes and industrial athletes alike. We enjoyed a lively discussion about integration of known principles of rehab with PRI paradigm of retraining a system of movement with specific attention to identifying pathologies and applying PRI treatment paradigms to rectify them. Thank you Susan "NC" Fain and Rob "Blue Shirt" Gillespie for keeping the instructor on his toes, thank you Bob Sahli and Meg Zimmer for integrating with the group on multiple fronts. Thanks Lindsey Flint, Aric Thorne-Thomsen, Dale and Patient Paul Mann for helping model demonstration of testing and treatment techniques during lab. Stephen Dobelbower provided the coolest name to say and some great dialogue as well. So many engaging clinicians determined to learn how identify asymmetry, facilitate and integrate--thanks again Montana Myokin crew! Very FUN weekend in the Boston area, at the host site Pure Performance in Needham, MA. Huge thank you to the Adam Vogel and his crew, BJ, Dan, Sam, Tad, and Micheal. Thank you guys for being gracious hosts and opening up your great training facility for us to teach the PRI Fitness & Movement Course. During this course I changed things up and was able to cover more material and teach attendees how to better reference different sections of the jammed packed course manual. We emphasized breathing as its relationship to postural balance as well as grounding and the biomechancial, physiological, and psychophysiology aspects which affect performance. Additionally, some of the basic yet crucial gait application and frontal plane principles needed for one to excel with a PRI integrated program were also emphasized and I taught how to apply to those principles to common fitness movement patterns. I am looking forward to finishing out the 2016 calendar in Arizona in November, and then restructuring and adding new content for 2017! Some quotes from the post course review sheets include: "Great Course, excellent presentation and coteaching from speakers. Course is easily digestable and simplified" "The flow of the course was awesome - incredible info very applicable to our athletic patient population"
We are adding courses to the website as we get the host site contracts back. We will be sending out our full brochure the first weekend of December. Be sure to check the website for new courses as we add them! Pelvis Restoration in the Windy City! Course in Review. Well after a nice summer break, I was back at on the road helping to grow the PRINation up North of the Windy City at Pilates Central. Donna Parise-Byrne and Dan Houglum were the hosts this weekend and they took great care of me and the course attendees. 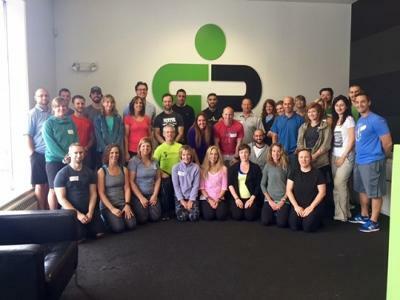 We had a 50/50 split of clinicians with PRI experience and newbies to the science. 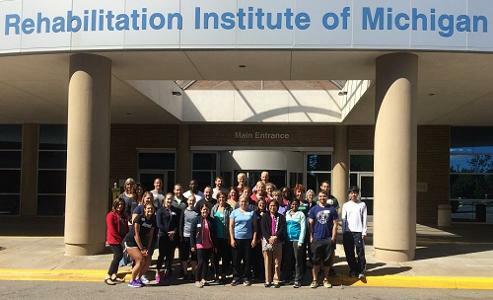 The group was represented by a diversity of clinical backgrounds from PT's, PTAs, ATCs CSCS, Personal Trainers and Pilates professionals. So fun to be able to discuss how to integrate PRI concepts in both rehab and wellness. We all had a blast learning about the Frontal plane control of the Pelvis as it relates to the Left AIC, PEC and Patho PEC patterns. I revived the Yellow VW analogy and low and behold I saw 3 that weekend! I love seeing the enthusiasm of those first learning about PRI and feeling its results in their own bodies. I do believe I will see some of these new faces in future courses!